I keep getting asked so.. Above is a map of all the 2nd hand joints in Edinburgh. There is also a whole string of shops in Leith. 23 books for 25p each! I had to get a taxi home. Everything I have is second hand. I am typing this on a super-duper 2nd hand computer (£40.00 inc. monitor). I am wearing 2nd hand clothes (except for pants and socks). I'm sitting on a swivel chair I pulled from a skip. I am drinking a cup of tea from a chess mug (car boot sale). at New Street car booty. Mint condition £2.00 each. I thrive on 2nd hand goods. being kept alive by a newly transplanted heart. at the Demarco Skateraw Project on the 28th October 2005. 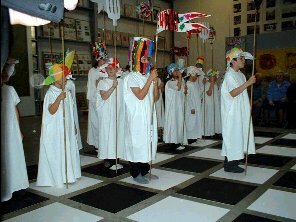 The 'bits' were played by pupils from Dunbar Primary School. 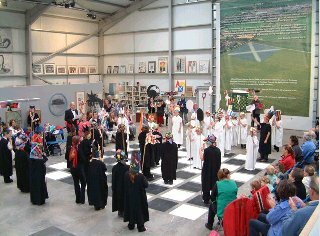 For a full report, plus full size pictures visit the Chess Scotland site. 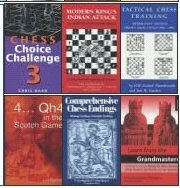 Now you must check out the Scottish Kids Chess site. where I achieved the highest in the whole world. Go on see if you can beat it. They also have a hangman. being hung a King (King Henry VIII). It would make the site unique! eg. They are Black in this position (Black to play). The have 8 guesses at a word. being mated by two lone Knights after promoting to a Queen. 3...h4 4.Nf4 h3 5.Ne6 h2 6.Nd4 h1Q 7.Nb3 mate. Having fun with a wee bit of learning as well. compiler went when my hard drive pack up. (that is why I had to get a new computer). replace the original Hangman 'GIFS' with those I used above. then 7, then 6 etc. Let your imagination go. take the required 30 minutes out and do it for the kids site. (...and don't you even think of charging). I received an email from my mate Rick Kennedy (USA). he gets the pawn back the game flattens out? Well Rick in this position you played 10 c4. the Queen unprotected so 11 c3 Nc6 12 Nd6+ wins. Best after 10 Qb1 is Nc6. When 11 Qb2 looks very good. Better to rip open the centre with 13 d5. I can just find nothing but White crushes. The Knight cannot move because of 14 d6. look for central pawn thrusts to open him up. able to deal with even the simplest tactic. In the ending 32 Kd3 allows Ba6+ with tempo. 32 Kc3 would have given you a good ending. ...and then the decaying Chandler brain cells had one last hurrah! book at Chessville in January 2005! Rick. Does your Irish friend know you played a BOOK MOVE against him? Not only a BOOK MOVE but a book you own, a book you reviewed. Oh dear, talk about taking an unfair advantage... Huh! And anyway, everyone knows after 1 e4 c5 the best move is 2 h3!! They did not ask to be born. And now they are forgotten, unwanted and in the way. 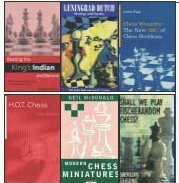 (five for £20.00, add £1.00 per book for UK postage). These books did not ask to be published. But they were. They came into this world all bright eyed and full of expectation. What sort of chess library home would they be going too? How often would they get read by an interesting person. Would they use a book mark or fold down a page? They thought they were written with love, care and understanding. cobbled together by a computer and human after a fast buck. please call and place an order today. of the books are very very good. All the more reason to rescue them. 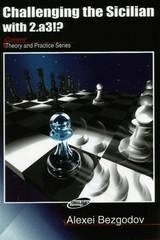 Learn from the Grand Masters, Winning Moves. There is a good £20 worth. (£25.00 with post). Kmoch's goofy use of the English language - excellent games). worth a read. His books are good. and anything by Schiller. Go on give them a ring and see what's left. Tell them Geoff sent you.